The mesh screen is the core of a strainer and is designed to be effective as well as durable to provide function precisely. The mesh screens are designed in standard and tailored specifications to meet the needs of most applications. Tailored designs are used most usually in applications with higher viscosity liquids. The mesh baskets and screens are available in Monel mesh and stainless steel 316 materials. These alloys provide corrosion resistance to all levels of strainer applications. Basket includes a perforated sheet that is connected to a sturdy top area and durable bottom. Heavy duty screens are placed inside the top ring and bottom. They are rolled to develop a flawless cylinder. You can weld it along the seam to avoid the passage of solids and to provide required strength. The screens are machined to specific dimensions and their lengths are closely toleranced. Mesh screens for basket filters are usually perforated sheets. The magnitude of open area of a screen usually defines the internal pressure drop that occurs throughout it. The perforated monel mesh creates the best balance of open area, hole arrangement and sheet thickness. Heanjia produces screens by using perforated sheet of materials with round pores because they provide higher strength and resistance to stress corrosion cracking. Generally a sheet with larger open area comprises thinner thickness. With closer punching of holes for large open area, the solid part between the pores deforms and loses strength. In order to control the thickness of perforated sheet, its hole diameter should be considered. It is not possible to have hole specifications smaller than thickness of a sheet. Pores are made in a straight line or in a staggered manner to increase the open area, provide additional strength and reduce pressure drop. Strainer screens are also made with woven wire mesh screens. They have smaller openings and are fit for very fine straining applications. Woven Monel mesh is made by using different types of weaving techniques such as plain weave, dutch weave, dutch plain weave, twill weave etc. Heanjia offers the complete line of standard Monel mesh screens for use in the industrial scale filtration applications. Monel mesh provides excellent resistance to alkalis, acids, sea water etc. It has high durability and tolerance to high temperatures. 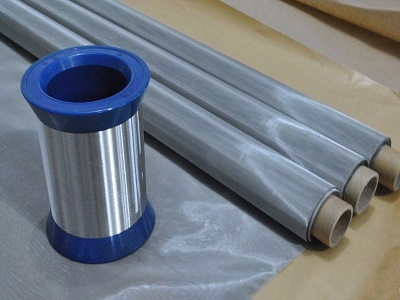 The Monel mesh screens are made in strip size to large sheet size. These screens are made from high performance metals and alloys that have essential mechanical and chemical properties that make these materials ideal for use in filtration plants. A large selection mesh sizes are made available and hence these mesh screens can be supplied in a choice of sizes and profiles. Monel mesh provides outstanding corrosion resistance so it can be used in various aggressive chemical applications. Various mesh patterns are designed for use in different applications. Contact Heanjia to order your Monel mesh in required specification.